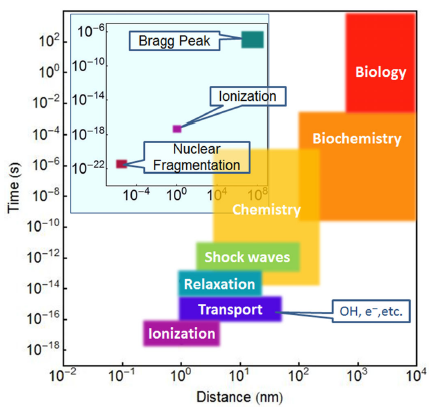 Features, processes, and disciplines, associated with radiation therapy shown in a space–time diagram, which shows approximate temporal and spatial scales of the phenomena. The history from ionization/exciation to biological effects on the cellular level are shown in the main figure and features of ion propagation are shown in the inset. In this EPJ D Colloquium, the authors review the multiscale approach to the assessment of biodamage that results from the irradiation of biological media with ions. This approach is explained in depth and compared to other approaches. The ion propagation processes that take place in the medium concurrent with ionisation and excitation of molecules, transport of secondary products, dynamics of the medium, and biological damage, take place on a number of different temporal, spatial and energy scales. The multiscale approach, a physical phenomenon-based analysis of the scenario that leads to radiation damage, has been designed to consider all relevant effects on a variety of scales and to enable quantitative assessment of biological damage as a result of irradiation with ions. In this EPJ D Colloquium, the authors discuss the main principles, achievements and perspectives in the fields of highly-parallel luminescence spectroscopy and the imaging of single molecules (SMs) in transparent solids. Special attention is given to SM detection at low temperatures, where ultranarrow and bright zero-phonon lines (ZPLs) can be generated by emitting centres for observation. 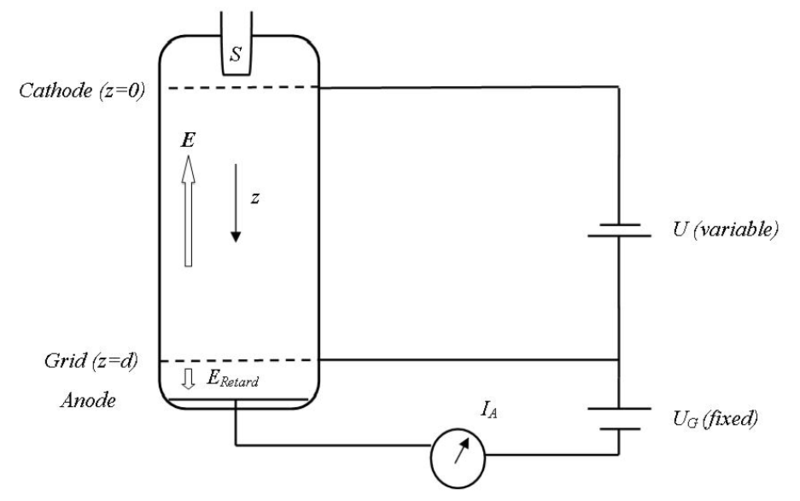 Energy correction factor for two gold plates in the absence of any intervening plasma. © Ninham et al. A new theoretical work establishes a long-sought-after connection between nuclear particles and electromagnetic theories. Its findings suggests that there is an equivalence between generalised Casimir forces and what are referred to as weak nuclear interactions between protons and neutrons. The Casimir forces are due to the quantisation of electromagnetic fluctuations in vacuum, while the weak nuclear interactions are mediated by subatomic scale particles, originally called mesons by Yukawa. These findings by Barry Ninham from the Australian National University, in Canberra, and European colleagues, have now been published in EPJ D.
Set up of the experiment showing the orthogonal side illumination. © A. N. Vetlugin et al. Russian scientists have developed a theoretical model of quantum memory for light, adapting the concept of a hologram to a quantum system. These findings are included in study just published in EPJ D, by Anton Vetlugin and Ivan Sokolov from St. Petersburg State University in Russia. The authors demonstrate for the first time, that it is theoretically possible to retrieve, on demand, a given portion of the stored quantised light signal of a holographic image—set in a given direction in a given position in time sequence. In this EPJ D colloquium paper, the authors review a cross-section of recent results relating to low-energy positron scattering from atomic targets, and present a comparison of the latest measurements and calculations for positron collisions with the noble gases, together with a brief update on the newest studies addressing other atomic targets. In particular, they provide an overview of the work that has been done in examining elastic scattering, positronium formation, direct and total ionisation, as well as total scattering, at typical energies ranging from 0.1 eV to a few hundred eV. New theoretical physics models could help us better grasp the atmospheric chemistry of ozone depletion. Indeed, understanding photoabsorption of nitrous oxide (N2O)-- a process which involves the transfer of the energy of a photo to the molecule--matters because a small fraction of N2O reacts with oxygen atoms in the stratosphere to produce, among other things, nitric oxide (NO). The latter participates to the catalytic destruction of ozone (O3). Now, new theoretical work unveils the actual dynamic of the photoabsorption of nitrous oxide (N2O) molecules. These findings by Mohammad Noh Daud from the University of Malaya, Kuala Lumpur in Malaysia, have just been published in EPJ D. The work has led to new calculations of the probability of an absorption process taking place, also referred to as absorption cross section, which confirm experimental results. Bohmian mechanics provides an explanation of quantum phenomena in terms of point particles guided by wave functions. This EPJ D review focuses on the formalism of non-relativistic Bohmian mechanics, rather than its interpretation, and although the Bohmian and standard quantum mechanical theories have different formalisms, they both yield exactly the same predictions for all phenomena. Over the past 15 years, the density matrix renormalisation group (DMRG) has become increasingly important for ab initio quantum chemistry. Its underlying wavefunction ansatz, the matrix product state (MPS), is a low-rank decomposition of the full configuration interaction tensor. 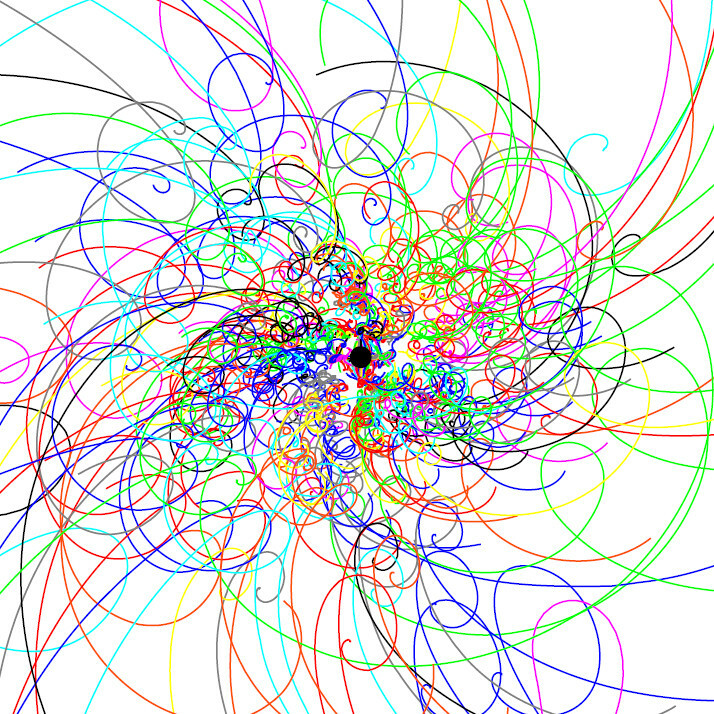 The virtual dimension of the MPS, viz. the rank of the decomposition, controls the size of the corner of the many-body Hilbert space that can be reached with the ansatz, and can be systematically increased until numerical convergence is reached. The MPS ansatz naturally captures exponentially decaying correlation functions, and the DMRG therefore works extremely well for noncritical one-dimensional systems. Time-frequency analysis of dipole acceleration extracted from the numerical simulations performed in argon, for three different regimes of laser intensity. © Pérez-Hernández et al. Ever heard of the water window? It consists of radiations in the 3.3 to 4.4 nanometre range, which are not absorbed by the water in biological tissues. New theoretical findings predict a novel way of achieving coherent radiations within the water window. These could be the basis of an optimal technique to obtain a high-contrast image of the biological samples or to be used in high-precision spectroscopy. Now, a new theoretical study identifies the physical mechanism needed to efficiently generate the harmonic radiations - which are multiples of an incoming laser’s frequency - at high laser intensities that occur beyond the saturation threshold of atoms and molecules. 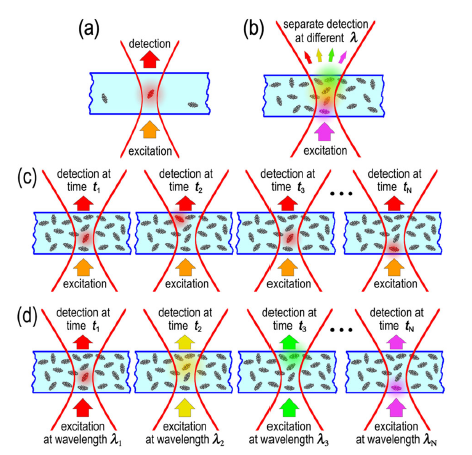 These findings, aimed at improving conventional methods of coherent radiation production to reach the water window, were recently published in the EPJ D by José Pérez-Hernández from the Centre for Pulsated Laser, CLPU, in Salamanca, Spain, and colleagues. The seminal 1914 experiment of James Franck and Gustav Hertz provided a graphic demonstration of the quantisation properties of atoms, and thereby laid the foundations of modern atomic physics. This EPJ D colloquium revisits the experiment on the occasion of its Centenary and compares the traditional and modern interpretations, as well as highlighting the link between microscopic processes, which are governed by the laws of quantum mechanics, and macroscopic phenomena, as observed in the laboratory.